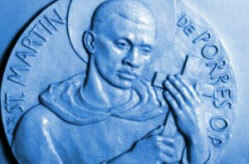 Martin de Porres started without much chance of success in life. He was born 1579, in Lima, Peru, with dark skin in a country that had become dominated by white Europeans. He was the son of a Spanish nobleman and soldier, Juan de Porres, from Alcantara, and of a freed Panamanian slave, Anna Velasquez. This was only a few years after Francisco Pizarro, having come through Panama and Ecuador, executed the Incan King in 1533 and imposed Spanish rule on Peru. Juan had come over to Peru via a similar route to help with the aftermath of the conquest, transforming the ancient Incan Empire. The place of blacks and mulattos (children of Spanish-Black unions) was a low one. The Spaniards had been obtaining slaves from the Congo and using them to build up a new civilization in the Americas. For example, at the time Juan de Peres arrived, there were about three thousand enslaved Africans in Peru, half of them residing in Lima. Martin's father left him, his younger sister, and his mother. They ended up living in the poorest part of Lima. Martin and his sister grew up in poverty; his mother earned a small income taking in washing. Based on the conditions of his birth, one could say he had little ability to become anything, but Martin would surprise everyone. His father returned when Martin was about 10 years old and took responsibility for getting his children into a better life. He arranged to have Martin and his sister get two years of schooling in Ecuador. After that, Martin was sent to work with a barber-surgeon in Lima from whom he learned some medical knowledge and insights into the care of the sick. At the time, medical practice was not a highly regarded field, and the barber-surgeons were low on the medical scale, gradually being supplanted by better trained medical surgeons. A lot of the medicine of that time had to do with blood-letting and cutting away growths, and other minor practices (including cauterizing to stop bleeding), the sort of requirements that would be entrusted to the local barber who had some skills with using sharp instruments and the limited instruction available, mostly that passed on from prior generations through apprenticeship. 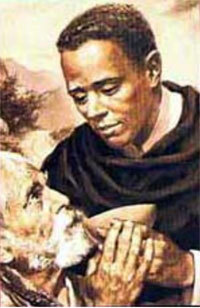 At age 14 or 15, Martin completed his work with the barber-surgeon and became a servant in the Dominican Convent of the Holy Rosary, which had been recently established. The Dominicans came early to Peru. 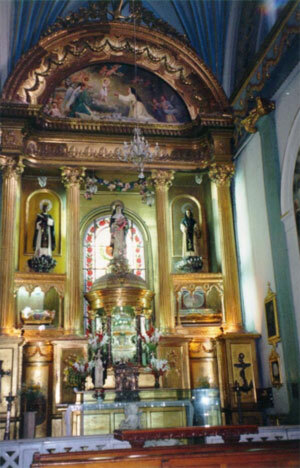 Five Dominicans left Spain for Peru in 1529, accompanying Pizarro; among them was Father Vincente Valverde who would become the first bishop of the region. In 1534, the first Dominican convent was built on an Incan temple in Cusco. 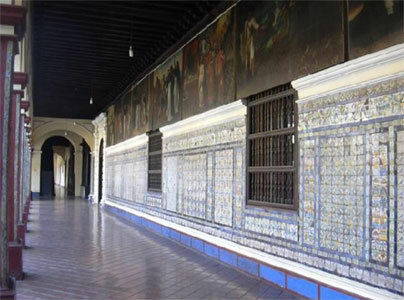 In 1538, the foundations for a cathedral were laid in Lima (today known as the Lima Cathedral), and a Dominican Monastery (Brothers of Mercy) was also set-up. 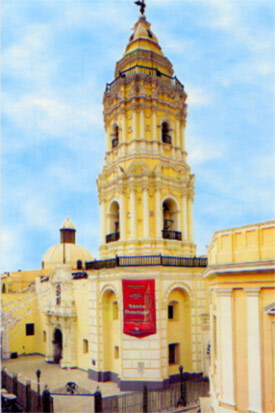 The Dominican Province of St. John the Baptist was established in Peru around the year 1540. Construction of the large Dominican convent where Martin served was begun in 1549, but was not finished until 1599, several years after Martin arrived. Because of his diligent work, Martin was promoted to alms collector: he begged from the rich to support the poor and sick of Lima. 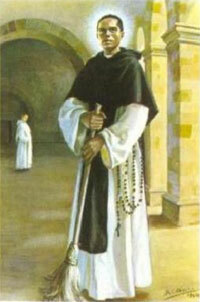 The archbishop of Lima at the time was Toribio de Mogrovejo (1538-1606), who would later be canonized a saint. Martin was confirmed by the Archbishop. Because of his prior background with the barber-surgeon and his obvious interest in helping the sick, Martin was placed in charge of the Dominican's infirmary when he was 24; there his reputation for tender care of the sick grew. 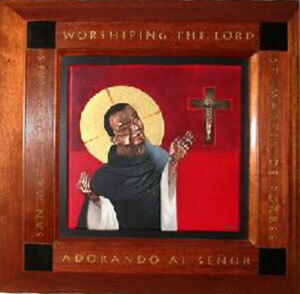 The Dominicans were so impressed that they also dropped the former opposition, based on his race, and he became a Dominican tertiary. 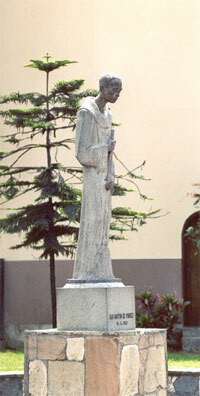 Martin's contemporaries included Saint Rose of Lima and Blessed John Massias, who was a lay-brother at the Dominican priory of Saint Mary Magdalene in Lima. 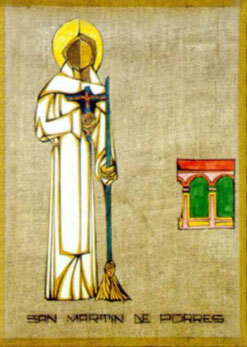 He soon became known in Lima not only for his caring attitude and willingness to do whatever work was needed (he is often shown with a broom because of this), but also for his spectacular cures, which were likely the result of his spiritual progress more than specific medical knowledge. 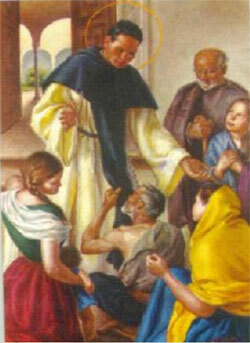 From that position, he was able to establish an orphanage and children's hospital for the poor children of the slums. He even set up a shelter for the stray cats and dogs and nursed them back to health (thus, he is also often shown with one or more animals at his side). He chose a life of asceticism, and spent much time in prayer and meditation. 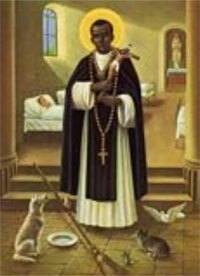 He was venerated from the day of his death in 1639, and was later canonized a saint (by Pope John XXIII in 1962). 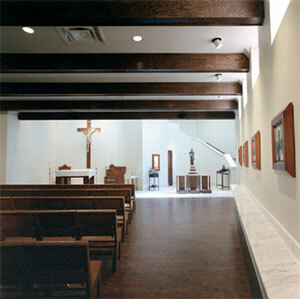 depict scenes in St. Martin's life and serve as prayer stations. 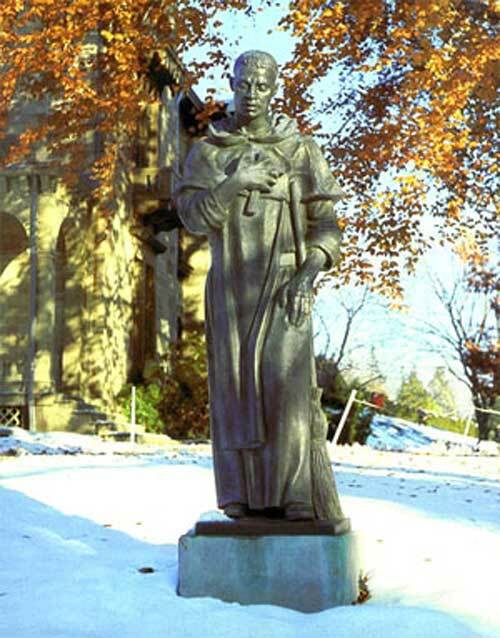 St. Martin sculpted in 1930 by Dominican Thomas McGlynn at Providence College, Rhode Island. 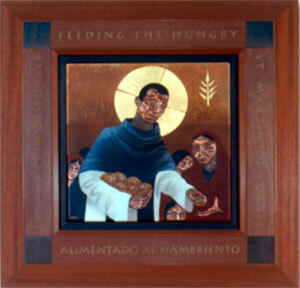 Prayer Triduum from Missionaries in Action, the Dominican Mission Foundation. 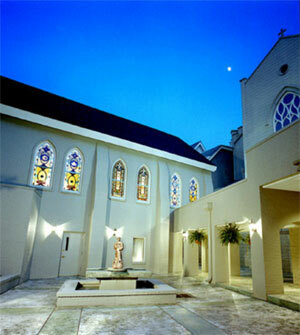 St. Martin, you always had sympathy for the poor and those who were suffering. I need your help and now ask for it with great confidence in your goodness and power. Please remember me, as you adore God. Amen. 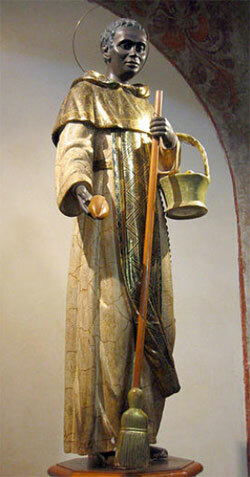 Closing Prayer: Dear St. Martin, I turn to you in my sorrow and anxiety to seek your friendly protection. Please intercede for me with our merciful Father in heaven so that I may be truly sorry for all my sins and be freed from the evils that shackle me. Ask that I might have something of your spirit of love and self-sacrifice, and so be at all times reconciled to God's holy will. Oh heavenly Father, in the name of your Son and of His blessed Mother, and by the merits of your faithful servant Martin, help me in my trouble and do not forsake me. Amen. St. Martin, we praise God for the manifestation of His love. The favors you received from God encourage us now to seek your intercession and help. We ask you most humbly to befriend and assist us from your place in heaven; but most of all, we beg you to commend us to our beloved Lord and Savior, Jesus Christ. Amen. Brother Martin, when you were here on earth, you spent your life loving God and your neighbor. This we know from the testimony of your own Dominican brethren. Now that you live in the presence of God in paradise, intercede for those who stand so much in need of the healing help of God and beg the Divine Physician to give us health of the soul and body. Amen.